What is a fibular free flap? A fibular free flap is one way of filling a bony hole in either the upper or lower jaw. It is one of the common ways of replacing bone that has been removed for cancer treatment. There are potential complications with any operation. Fortunately with this type of surgery complications are rare and may not happen to you. However it is important that you are aware of them and have the opportunity to discuss them with me. Bleeding – since a “drain” is inserted into the wound bleeding is unusual. Infection – you will be given antibiotics through a vein whilst you are asleep and for the first few days after surgery. As a result infection is not normally a problem. Numbness – sometimes you may notice a small patch of skin on the lower part of your leg or foot that is numb or tingly after the operation. This numbness may take several months to disappear and in a minority of patients may last for ever. Flap failure – in 2 – 5% of cases one of the blood vessels supplying or draining the flap can develop a blood clot within it. This means that the flap doesn’t get any fresh blood or, if the drainage vein clots, then the flap becomes very congested with old blood. It is an occurrence that usually happens within the first two days and means that you will have to return to the operating theatre to have the clot removed. Removing the clot is not always successful and on these occasions the flap “fails” and an alternative method of reconstruction sought. Will I have problems walking? In the long term removing the fibular bone should produce no problems in walking. You will be on bed rest for a day or two after surgery. Soon after this hopefully you will be sitting out in a chair. With the help of physiotherapists you will start to walk at the end of the first week. By the end of the second week you should be walking near normally and climbing stairs. Very occasionally you may need help (a stick) for a further week or so. I will remove one of the bones from the lower part of your leg. The fibular bone runs on the outside of the leg from the knee joint to the ankle joint. It is a small thin bone that can be entirely removed without affecting your ability to bear weight. The fibular bone is removed (the flap) along with two blood vessels, one of which supplies blood to the flap (the artery) and one of which drains blood from the flap (the vein). Once the bone is raised it is transferred to the head and neck and secured in position with small plates and screws. 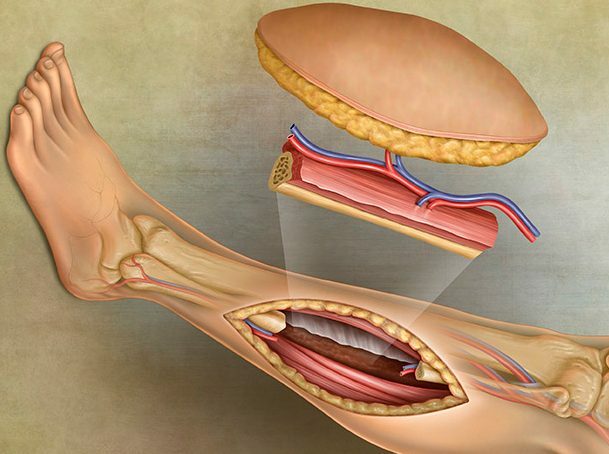 The blood vessels supplying and draining the flap are then joined to blood vessels in your neck under a microscope. These blood vessels then keep the flap alive while it heals into its new place. Your leg will be placed in a bandage for a week following surgery. Occasionally it is necessary to remove a piece of skin in addition to the fibular bone. If the piece of skin that is removed is large it will need to be replaced with a skin graft. The area of your leg where the bone has been removed is likely to be sore. Regular painkillers will be arranged for you. A small tube is also placed through the skin into the underlying wound to drain any blood that may collect.This “drain” is usually removed after a few days. All cuts made through the skin leave a scar but the majority of these fade with time. The scar on the outside of your leg runs from just below the knee joint to just above the ankle joint. Occasionally I may use other flaps such as the lateral thigh flap, scapula flap, latissimus dorsi or pectoralis major dependent on the reconstructive problem.